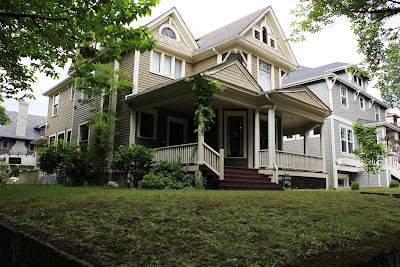 I had the opportunity to do a Q&A with the owner of the house used as Nick & Juliette's place in Grimm. Your questions answered, and more. Enjoy! 1. How did your house come to be used on Grimm? did NBC approach you? We had just had our offer accepted on the house when our realtor told us that NBC would like to meet with us regarding using our house for a pilot TV show. We had never bought a house before, but were pretty sure that this was not standard! - We were asked to meet with them in an office building in NW, and walked in to find pictures of every angle of our house plastered all over the walls. It was bizarre. - They explained that they had found our house driving around Portland and scouting and would like to use it for the pilot. - We agreed and they did a few renovations (mostly demolition of a few things that we wanted) and filmed the week before we moved in. - Once the show was picked up as a series, they built the inside of our house on a set in NW Portland and now they just come to film exterior shots. We were able to visit the set last year and it was really strange! It's definitely different than our real house, but similar enough for TV. 2. What was it like having a film crew in your house and how long/often were they there? The filming crew is very professional and respectful of our space. They initially filmed for 3-4 full days for the pilot episode before we moved into the house. Since then they have returned every 2-3 months on average for 4-6 hours to film an exterior shot, usually after dark. 3. Are they still filming at your house? Yes. They were here 2 weeks ago. We never have much notice when they are coming as they film each episode in 8 straight days. They don't plan each episode until the week or two before filming starts. Each episode has a different director and I think that there are two different crews so that one can be filming while the other is planning. 4. What does NBC pay for house usage? I won't give specifics, but they do pay us. 5. Did NBC digitally enhance the house color and surroundings? 6. Any other facts or comments you think would be of interest to viewers/readers? - Everything is fake! They use fake trees, fake doors, fake everything! When they initially used our kitchen, none of the cabinets or drawers opened as it was just a facade. - There are so many people involved, it is incredible. When they come, there are blocks and blocks of semi trucks, lifts, lights, prop managers, makeup, wardrobe, etc. Lots of people stand around a lot and they film each little scene over and over. - David, the main actor in the show is very nice. He remembers our names and goes out of his way to say hello. Thanks to the owners of "Nick & Juliette's house" for their time and information! 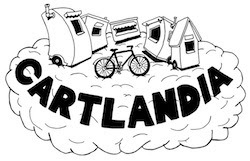 And for those of you Grimm tourists doing drive-bys and walk-bys, please continue to be respectful of the real people living in this home and others around Portland. The interior has the flavor of Frank Lloyd Wright. From the earthy wall colors, dark brown trim boards, down to the push button light switches. Any FLW connections? "Fake everything"? Maybe that's why I saw square columns instead of round ones on the porch on one episode. Or maybe it wasn't? Does anyone know anything about the green bird painting in the home? I found this post looking for the answer to this very question. Curious as to whether it is one of a kind or if there are copies, prints, giclees out there somewhere. :) I notice it every time it's in the frame. The colors are amazing. In some exterior scenes shot from far back there appears to be a mezuzah on the house, but it isn't there in close up shots of the door. Is there a mezuzah on the real house and a fake exterior front door on the set?